Maybe it’s all of the yellow daffodils and Spring in the air, but I just had to find a lemony dessert for my bunco group last week. Nice of Anne Byrn the “Cake Doctor” to have the perfect recipe for me. She has the BEST recipes. 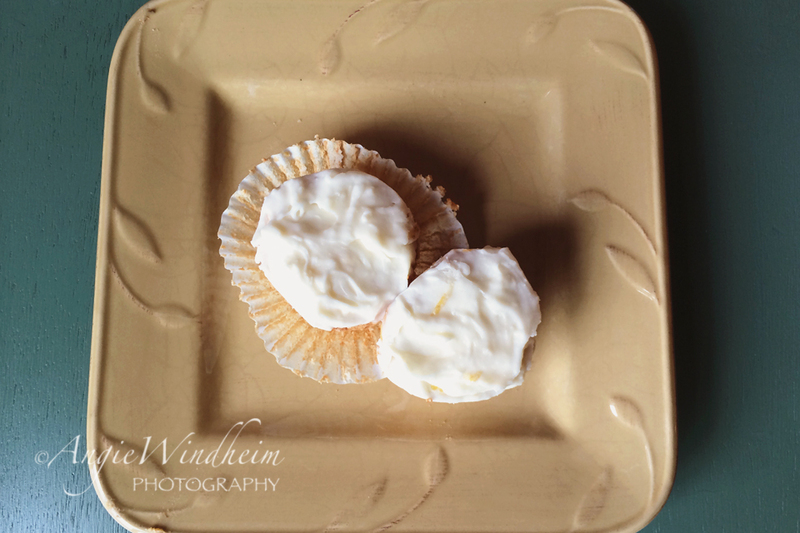 Angel Food Cupcakes with Lemon Cream Cheese Frosting are featured in Cupcakes! : From the Cake Mix Doctor . Angel Food Cupcakes with Lemon Cream Cheese Frosting are bright and creamy and go down a little too easily. I handed them out to my boys, blinked and they were asking for a second cupcake. I couldn’t resist having two as well. I just needed that flavor in my mouth a little longer. The original recipe calls for some crushed lemon drops on top of the frosting. I couldn’t find any at my local grocery store. I guess that candy is too retro for Safeway. But, then I’m not a big fan of crunchy things on my cupcakes anyways. Angel Food Cupcakes with Lemon Cream Cheese Frosting are perfect without them. Line two standard cupcake pans with the paper liners. In a large mixing bowl, pour in angel food cake mix, then water, then lemonade concentrate. Mix a little by hand first. That mix will explode on you! Then mix on low for one minute. Stop the mixer, scrape down the sides and mix for 2 minutes more. Use a big serving spoon and another smaller spoon to scoop and scrape batter evenly into the cupcake pans. The batter is super sticky…almost like marshmallow cream. Bake cupcakes for 20-22 minutes. They should be lightly golden and if you press your finger in the middle, the cupcake will spring back up. Allow the cupcakes to cool in the pan for 5 minutes on a rack. Then remove them from the pan and cool for another 20 minutes before frosting. Store the frosted cupcakes in the refrigerator to keep them moist and creamy. In a large mixing bowl, blend butter and cream cheese on low speed. Slowly add and blend in powdered sugar, lemonade concentrate and lemon zest. All ingredients should be thoroughly combined and frosting thick but spreadable. If it’s too thick, add a little more lemonade concentrate. If it’s a little too runny, add more powdered sugar.